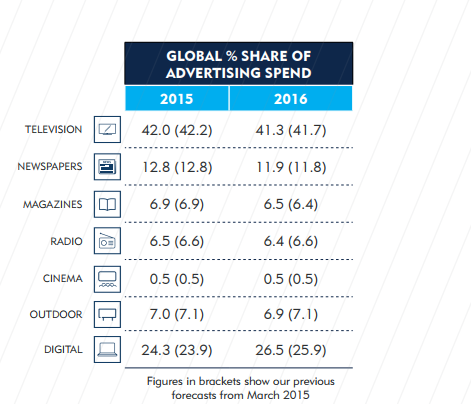 Global Advertising Spends by Percentage across entire media ecosystem. 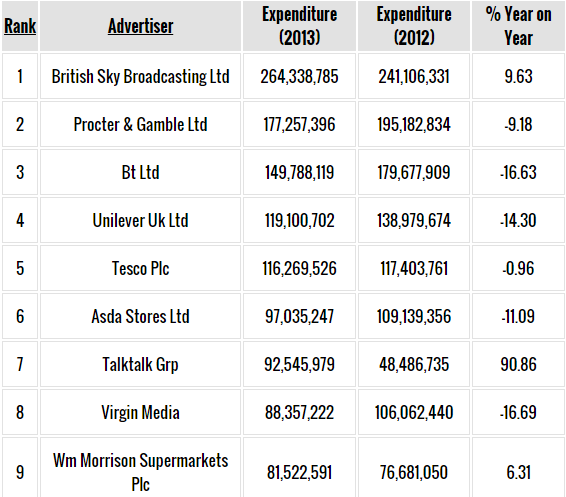 Of the top 25 advertisers in UK .Around, 14 of them reduced adpsend in 2013. Most notably, EE slashed its spend by the largest degree by nearly 40% in the 12 months following its launch, from £87m in 2012 to £53m in 2013. Another big cut in spend came from Marks & Spencer, which, in 25th place, cut spend by 25% to £50.7m. 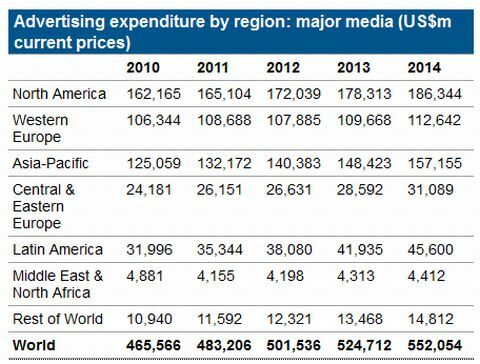 top 20 ad spending by British brands"
Worldwide advertising spend rose 3.1% year-over-year in Q1 tao reach $128 billion USD, per new figures released in June 2012 by Nielsen. 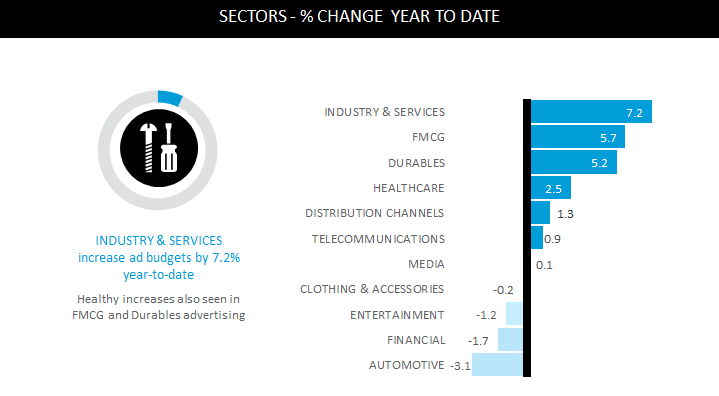 Ad spend gains were minimal in January, but picked up steam in the following months, with spending in March 4.5% higher than in the previous year. The report notes that the Q1 2012 gain might have come as a result of depressed spending a year earlier, when market conditions and political unrest were more pronounced. 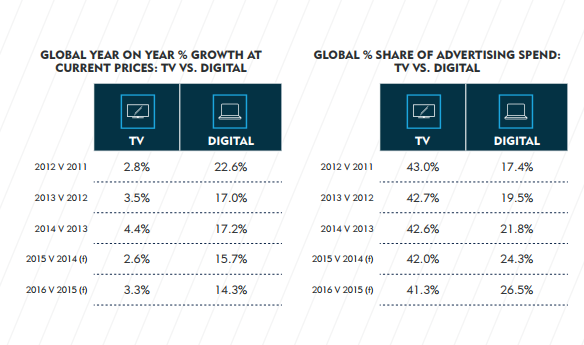 Nielsen earlier reported 7.3% ad spend growth in 2011, though that figure was limited to major traditional media (TV, radio, magazines, and newspapers). 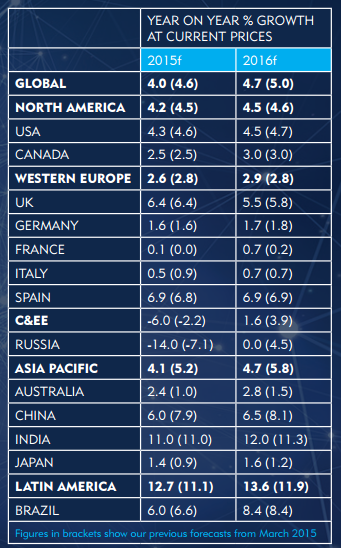 The 3.1% growth rate reported in Q1 is slightly below the 4.3% rate forecast for 2012 by ZenithOptimedia and the 4.8% rate predicted by Warc. 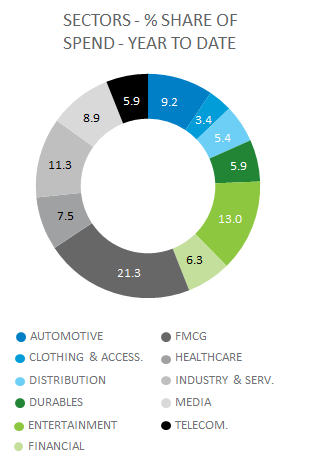 The Middle East and Africa saw the most rapid Q1 growth, as spending grew 23.3% year-over-year. 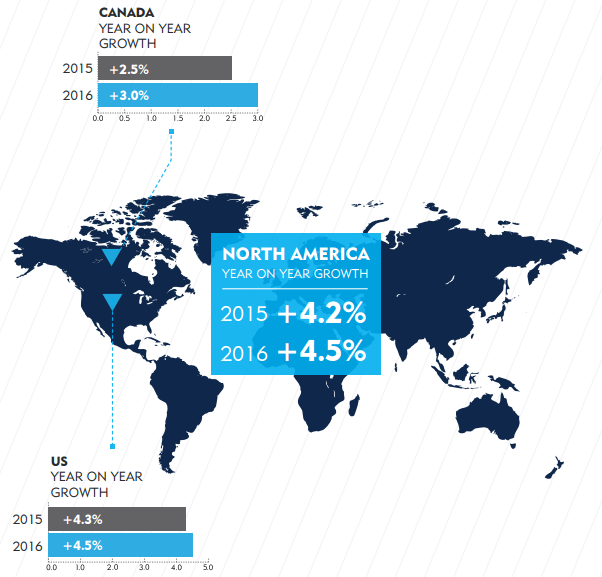 Latin America also posted strong gains in Q1, according to the Nielsen figures, with spending increasing by 9.6% from a year earlier. 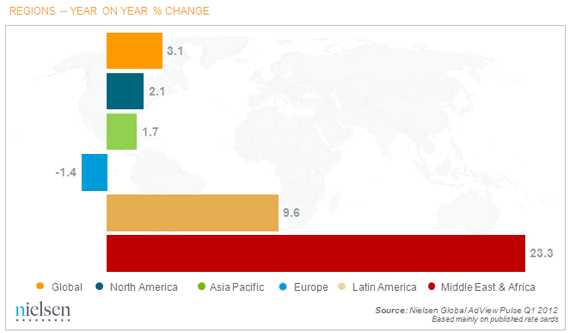 2011 Closed with 7.3 Percent Increase in Global Advertising Spend | Nielsen Wire: "ccording to Nielsen’s quarterly Global AdView Pulse report, global advertising in 2011 totaled USD 498 billion (mainly based on published rate cards and four traditional media types), and Q4 2011 closed with 131 billion, up 6.2 percent over the same period in 2010. Spending for Internet, Outdoor, and Cinema also all showed increases in 2011 when compared with 2010. 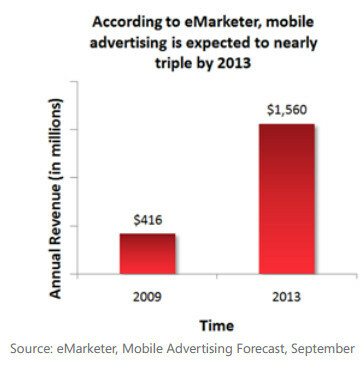 Internet ad spending, which grew by 24 percent in 2011 vs. 2010, saw increases in almost all markets measured."  According to Nielsen data , published in April,2012 In the U.S., advertising declined by 0.2 % year-on-year during Q4, but increased 2 percent in 2011 vs. 2010. 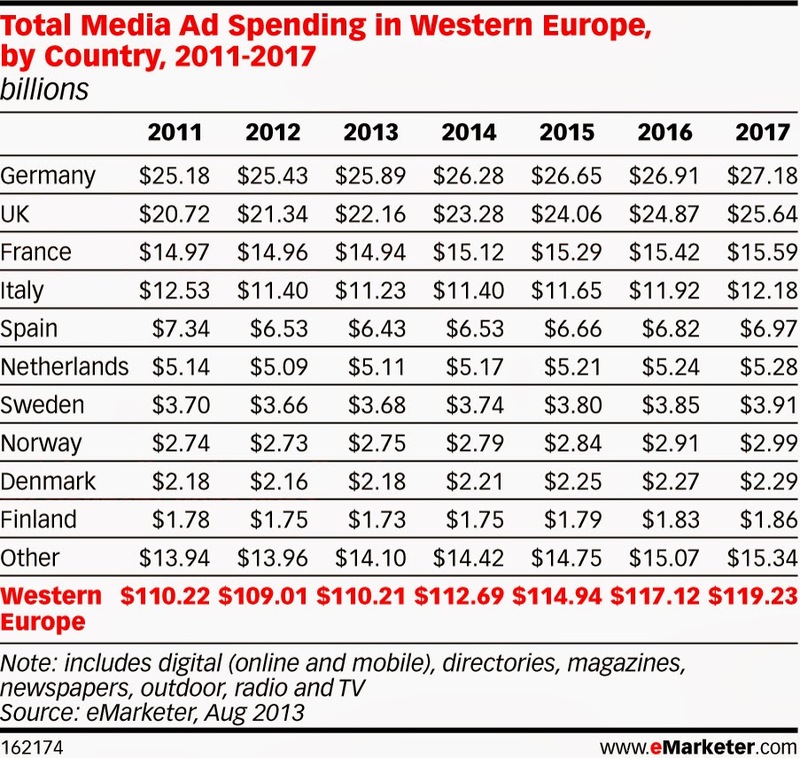 The European advertising market decreased spending by 0.4 percent in 2011 compared with 2010. Though many Northern European advertising markets measured marginally increased spending during 2011, larger decreases were seen in the Southern European markets of Greece (-13.1%), Italy (-4.0%), and Spain (-9.7%). 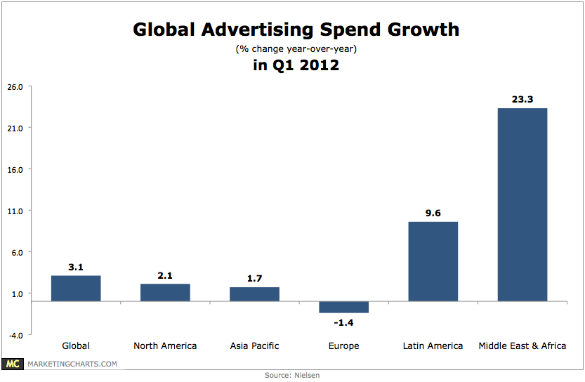 n Q3 2011 saw an increase in many of the world’s biggest advertisers, as compared to Q4,. In the year advertising saw an overall 7.3 percent increase in spending vs. 2010.